So I’m going to tell you folks a little story. You sitting down? What about you in the back? Okay? Good. Here it goes. So back in 2011 when I was still trying to get this blog going and was still at the very start of the grand journey of learning about beer, I went to my first Ontario Craft Beer Week event, which was a “meet the brewer for a tutoured tasting” thing with Mill St. Brewery at The Rebel House. Brewmaster Joel Manning and brewer Bridgid Young showed up with samples of their Original Organic Lager and Tankhouse Ale. And since the place wasn’t too busy, they sat down with me and taught me about the ingredients that go in to their beers. Even bringing bags of two types of grain and a bag of hops to show. Joel encouraged me to taste the grain that went in to their Tankhouse Ale and then try the beer. Suddenly I realized the source of the biscuit-like flavours I was tasting. Even with the hops, I learned how to take a handful of the flowers, grind it with my hands and smell the wonderful hints of citrus and sweetness that the hop is known for. It was my first exposure to the individual ingredients that went in to beer and was nothing short of a revelation on the senses for me and changed the way I looked (and, well, tasted) beer. Now and then when I do a tasting of a beer my mind sometimes goes back to the lessons I learned that day. So why am I telling this story? Am I too tired? Am I off my meds and just feel like rambling? 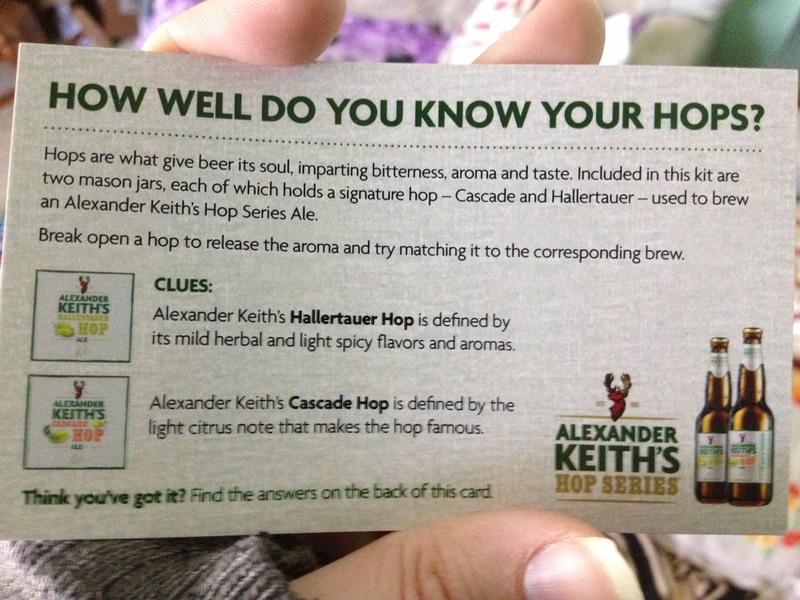 But also to segue in to talking about earlier this week when I went to the launch of Alexander Keith’s Hop Series of beers, which opened with two single-hop beers (that’s a beer that is made with one variety of hop); a Cascade Ale and Hallertauer Ale. Now, I’ve only tried the Cascade Ale so far and while it’s a pretty decent and comfortable offering (but not to my personal taste) I really need to bring attention to the packaging. The cans themselves talk a bit about the history of the individual hop they’ve used, which I think is a fantastic idea. Also press were given this little pack (seen on the right) that came with two small jars of flower hops. The only labels on the jars were “Hop A” and “Hop B”. And I thought that was such a brilliant way to get people learning about what goes in to beer and encourage a whole appreciation for it. 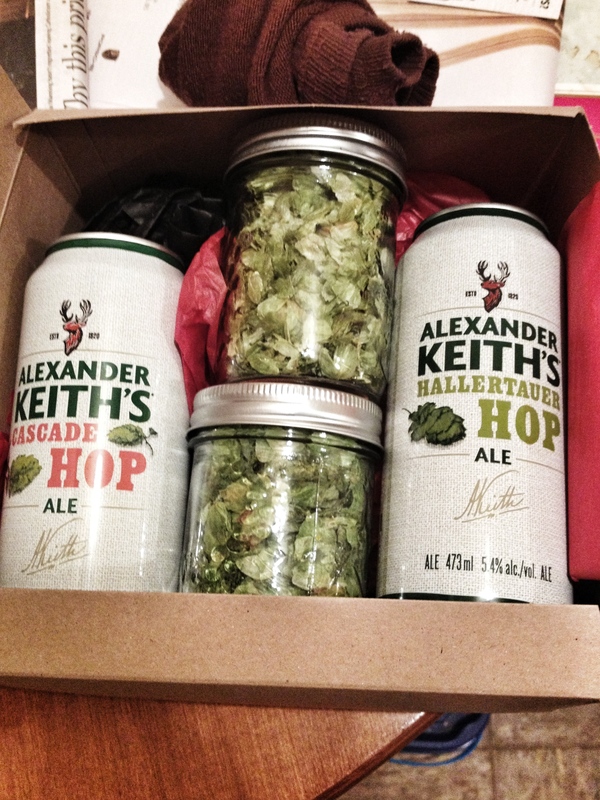 Sometimes when a 2-300 page book or big event seems too intimidating for a beginner in learning or when you just plain don’t know, it takes one person to show up with a jar of flower hops or a bag of malt and say “this is what went in to what you’re drinking”. Like in food, breaking something down to its raw ingredients increases an understanding in it. So say what you will about the taste of Keith’s, or dismiss them because they’re a big brewery, but I say they did something right here and that this is a pretty cool way to educate people about what’s going in to their drink. And that’s something.